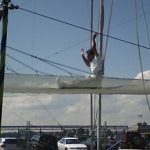 This summer, in an attempt to connect with my inner Carrie Bradshaw, I tried out trapeze on top of Pier 40 on the West Side Highway. It’s a lot of fun. You can even complete a catch – where a guy on the other trapeze catches you as you let go of the trapeze – on your first day.